Although the first CD I bought was They Might Be Giants, rock music like Rage Against the Machine and Nirvana was my first real musical love. The angst-filled rise of Seattle-centric grunge music coincided perfectly with my rise into adolescence and all of the pressure and confusion that goes with that. A major figure of that scene was Dave Grohl, Nirvana drummer who after the death of Kurt Cobain would emerge as one of the biggest stars in rock, as Foo Fighters frontman. 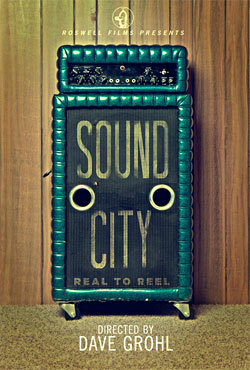 Sound City is Dave Grohl’s directorial debut and his love note to the west coast culture of rock music that created him. The title of this documentary is a reference to Sound City Studios, the Van Nuys-based recording studio which produced timeless American rock gods Fleetwood Mac, Nirvana, Rage Against the Machine, Tom Petty, and many more. It tracks the movement of rock culture over decades from the era of Neil Young through digital recording and into the 2000’s, by which time the death knell for recording studios had already sounded. How does a recording studio compete with all-in-one home-based recording solutions that are cheaper, ubiquitous, easy to use, and higher quality than ever before? In short, it cannot. The era of the recording studio being the creative center of breakthrough bands and artists is over, and digital recording killed it. But through this transition, is something lost? This is the question that Dave Grohl explores as he seeks out legendary recording artists and reflects on their experiences at Sound City over their most prolific years. The features in this film are incredible but it’s the undying passion that Dave Grohl has for the culture of rock music which elevates this documentary to the next level. In this way it’s similar to Ice-T’s 2012 documentary Something From Nothing: The Art of Rap. (Which also similarly is a must-see biopic produced by a universally respected innovator). My favorite parts were the passages that included Trent Reznor, Nine Inch Nails frontman and one of my favorite musicians of all time (ironically, among my favorite works of his is the Academy Award-winning score to 2010’s The Social Network). To promote the release of Sound City, Dave Grohl participated in a Reddit AMA, too. See this film for the jam sessions alone if you have no interest in the modern history of rock music. Incredible footage and an incredible story told me one of the few who are in a position to tell it. This is a story about real American culture.